Important landforms such as major regional slopes, hills or elevations, must be clearly visible from distance. These large landforms, identified by the different drainage basins, divide the relief shading into bright and dark areas. Santa Cruz Island, California. Analytical shading. Large landforms are accentuated using Photoshop tools. Images provided by Tom Patterson. 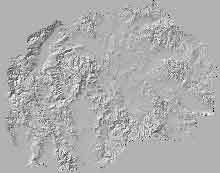 As a rule of thumb, for every point on the surface of a shaded relief, it should be clear in which direction a drop of water would drain off. The relief on the left shows many interesting details, but the large landforms are hardly visible. By contrast, the relief on the right eliminates this drawback. The different drainage basins are easily identifiable. The following two images try to illustrate the same problem at a smaller scale. On the left, the main landforms are not identifiable, since there are too many distracting details. The image on the right shows the same area, but with accentuated major landforms. Macedonia. Analytical shading from a too-detailed DEM. The large landforms appear much clearer after retouching in Photoshop. While large landforms show the overall configuration of the topography, smaller landforms often contain the unique details that bring character to a shaded relief. 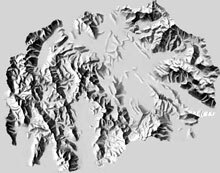 Small landforms are no less important than large ones, but an experienced cartographer will always concentrate on the major forms first when preparing a shaded relief. Work typically starts on easy-to-define shadowed slopes, and ends on bright summits.